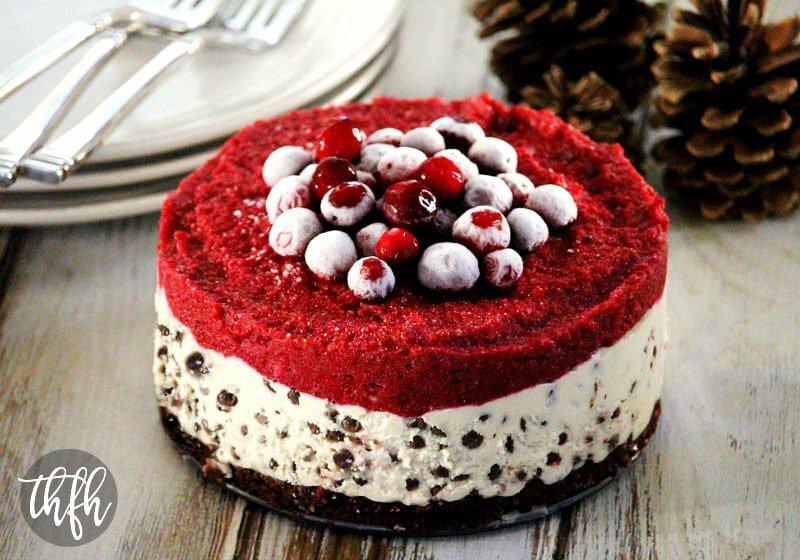 This Vegan No-Bake Chocolate Chip Cranberry Cheesecake is my submission for The Recipe ReDux for the month of November and it is amazing! My recipe this month is a holiday inspired cheesecake that is three layers of goodness! The bottom layer is a raw chocolate pecan crust naturally sweetened with medjool dates, the middle layer is a vegan no-bake cheesecake filled with mini chocolate chips and the top layer is a frozen version of my Clean Eating Cranberry Sauce. Now you can eat your cranberry sauce this holiday season in a delicious dessert! Don’t be intimidated by the ingredient list – it only takes about 15 minutes to make all three layers and then you just put it in the freezer for about an hour or so until it hardens. 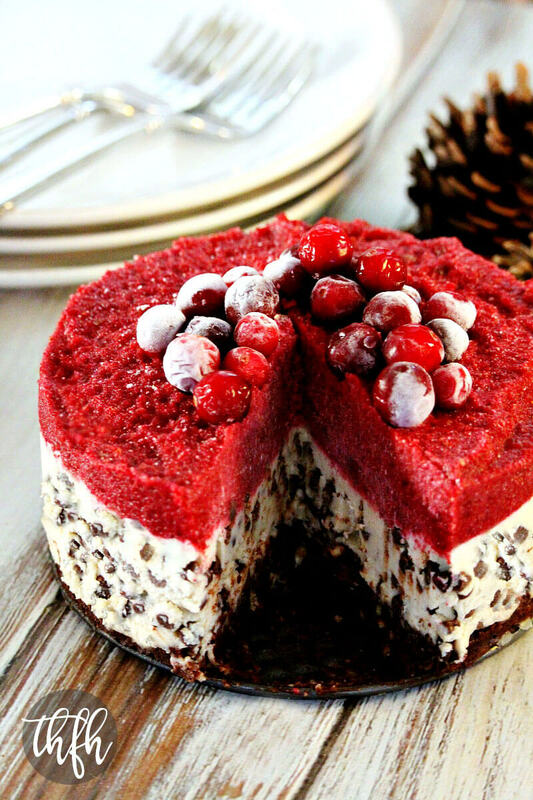 This unique take on a holiday dessert is organic, vegan, gluten-free, dairy-free, egg-free, soy-free, no-bake, paleo-friendly and contains no refined sugar. Want more healthy dessert recipes? 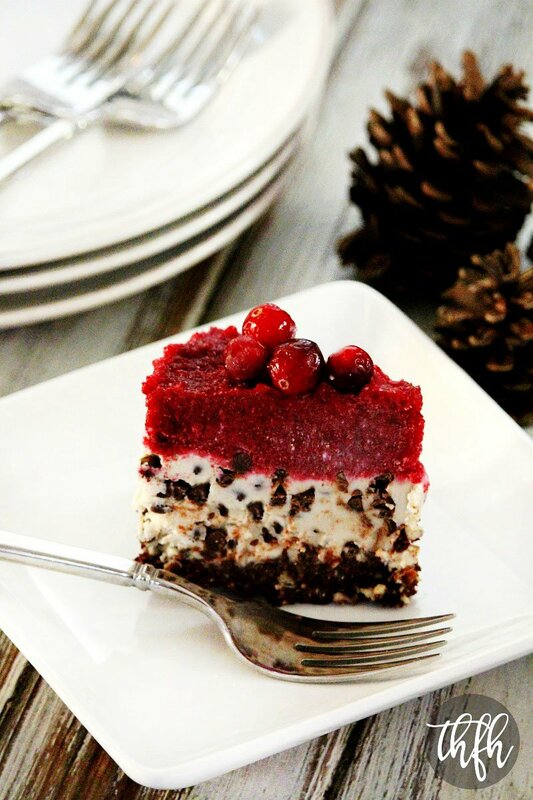 Check out Raw Vegan Banana Strawberry Swirl Cheesecake, Vegan Lemon Blueberry Swirl Cheesecake Squares, Vegan No-Bake Peanut Butter Cheesecake or my Clean Eating Cookbook with an entire chapter of 20 healthy, clean eating dessert recipes just like this one that you will love! Step 1 Add all the ingredients for the crust to a food processor and process until it is well combined and has a wet, sticky texture. Transfer the mixture to a 6-inch spring form cheesecake pan and press it evenly and firmly on the bottom of the pan. Place the cheesecake pan in the freezer to firm while you make the rest of the recipe. Step 2 Optional: Soak the cashews in a bowl of purified / filtered water for 30 - 60 minutes, then drain them prior to using. This will make them soft and the cheesecake mixture will be smooth and creamy. Add all ingredients for the cheesecake (EXCEPT the chocolate chips) to a Vitamix, or high speed blender, and blend until the mixture is creamy and smooth. Use your tamper, if needed. Remove the blender container from the base and make sure the contents are not warm before going to the next step. If the cheesecake mixture is warm from blending, wait until it cools off or the chocolate chips will melt. Add the chocolate chips to the blender container and gently stir them in until they are evenly distributed. Remove the cheesecake pan from the freezer and pour the cheesecake mixture on top of the crust, making sure it's evenly distributed. Rinse out the blender container to use for the next step. Step 3 Add all ingredients for the topping to a Vitamix, or high speed blender, and blend until everything is well blended. Use your tamper, if needed. Transfer the topping mixture on top of the cheesecake mixture and spread it evenly. Optional: garnish with extra cranberries in the center of the cheesecake. Place the cheesecake pan in the freezer for 1 - 2 hours, or until it hardens. Remove from the freezer and allow to thaw on the counter top 10 - 15 minutes, or until it is soft enough to slice. Store in the freezer until ready to serve because it will get soft and lose it's shape if left out at room temperature. This recipe will make approximately (8) small pieces. The recipe and photographs for "Vegan No-Bake Chocolate Chip Cranberry Cheesecake" by Karielyn Tillman of The Healthy Family and Home website are licensed under a Creative Commons Attribution Non-Commercial 4.0 International License and cannot be used without my written permission. Show-stoppingly beautiful. Those cranberries on top make the presentation. I would really love to try to make a dairy free cheesecake with cashew…you give me confidence to try. Happy Thanksgiving Karielyn…to you and your family! What a stunning combination! You really did pull out all the stops on this one. Bravo! Thanks for sharing, pinning for later!